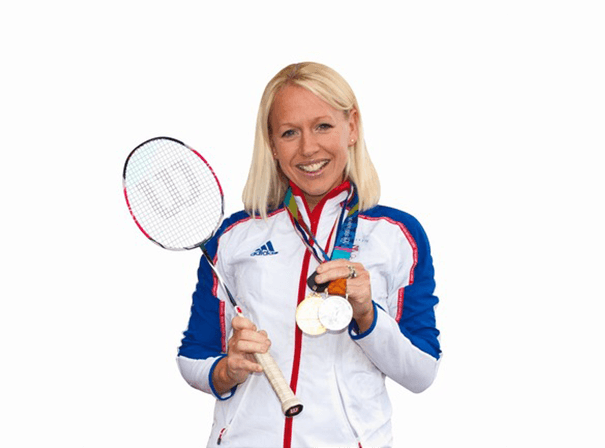 One of the world’s finest badminton players, Gail Emms is a determined sportswoman who can inspire all audiences with her after dinner speaking and exciting tales of life with the England National team. It was in 1995 that the Hertfordshire born lady got her England debut at the age of 18, some 14 years after starting to play the game at home in her garden. Since then, the retired badminton player has seen success in various tournaments, has been sponsored by sports manufacturer Wilson and earned a BSc (Hons) in Sports Science from Kingston University. Playing a number of singles and doubles matches in her career (as well as mixed doubles), Gail has scooped up two gold, one silver and two bronze Commonwealth medals, a gold in the 2004 World Championships and most notably a Silver in the 2004 Athens Olympics where she played alongside doubles partner Donna Kellogg. It is with mixed doubles partner Nathan Robertson, however, whom Gail has seen most wins, and in fact said pairing are thought to be Great Britain’s most successful badminton partnership ever. Now a mother as well as a Member of the Order of the British Empire (MBE) since 2009, Gails Emms has done many an after dinner speaking event since retiring in 2008, drawing on her experiences of playing around the world and playing alongside both men and women.